In response to my comment on Irish exports of goods data through April, one analyst suggested that things are not as bleak, citing expansion of industrial production in Traditional sectors as a sign of real economy improvements (as opposed to accounting economy of our MNCs-led tax optimisation exports). No doubt, the comment is correct. Things are not so bleak as Traditional sectors shrinking. In fact, they have been growing and with them, there has been some growth in indigenous exports too. 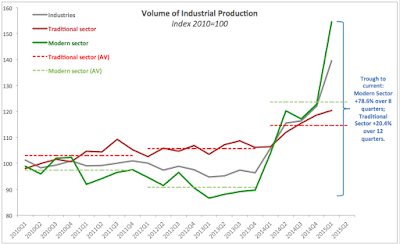 Here is the latest quarterly data on industrial production separating Modern sectors (MNCs-dominated) and Traditional sectors (which also include a large segment of MNCs, for example in food and beverages). Yes, Traditional sectors have expanded. Which is good news. But they expanded at a rate of 20.4% over 12 quarters, while tax optimising Modern sectors expanded at a rate of 78.6% over 8 quarters. Good news is not too great, it turns out. In Q1 2015, Modern Sectors output by volume rose 39.4% y/y while Traditional Sectors output rose 10.1% y/y. That's almost 4 times slower rate of growth for the Traditional Sectors. In April 2015, Modern Sectors output rose more reasonable 7% y/y (and shrunk 1.1% m/m), while Traditional Sectors output rose 11.3% y/y (and grew 4.7% m/m). That made April 2015 the first month since December 2014 that this happened. 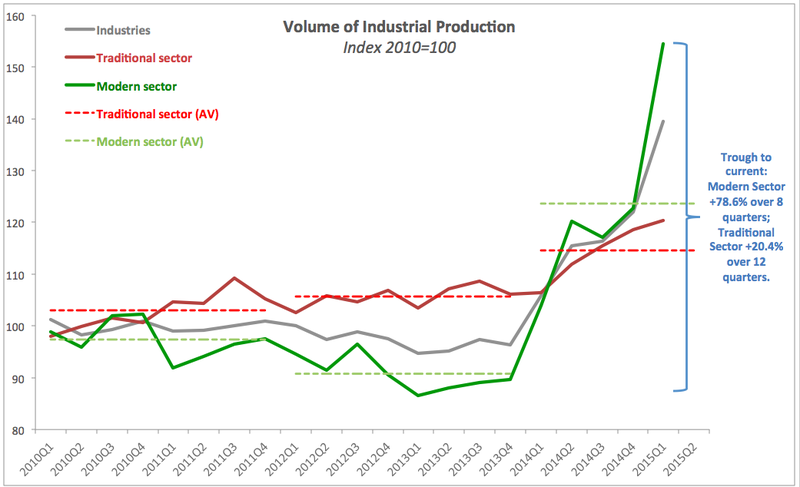 But what exactly did happen in April to drive Traditional Sectors output up faster than Modern Sectors output? Modern sector includes the following industrial sectors: NACE 20.00 - 21.20 Chemicals and pharmaceuticals: up only 7% in April y/y, NACE 26.00 - 27.90 Computer, electronic, optical and electrical equipment was up 44.8% in April y/y; NACE 18.20 Reproduction of recorded media up 34.8% y/y in April y/y; and NACE 32.50 Medical and dental instruments and supplies which goes into "Machinery and equipment, not elsewhere classified" reporting line - up 54.8% y/y. So I am slightly puzzled how did Modern Sector manage to post 7% growth when all components of the sector are growing at 7% or higher. The answer is, of course, in the CSO not fully reporting exact components of what is included in the Modern Sectors. On Traditional Sectors side, the biggest gaining sub-sector was "Other Food Products" at 13.2% y/y. Which means that the fastest growing Traditional sub-sector was growing slower than all but one Modern Sector sub-sectors.